Organize and easily identify garments by size, season or color with our Blank Closet Rod Divider. It fits on a standard closet rod and can be labeled with a wax pencil or by using our Label Maker. Perfect for organizing infant and toddler clothing. Blank Closet Rod Divider is rated 4.7 out of 5 by 16. Rated 5 out of 5 by spalmer60640 from Great to organize a closet The dividers make it very easy to organize items in a closet. I just used stickers to label the dividers. Rated 4 out of 5 by Kemc1580 from Good but not Great At .99 cents each it is a good option if buying at few. I found a package at the store (not available online) with 12 tags, preprinted labels included for $9.99. I immediately returned these ones and bought the other one. Rated 5 out of 5 by tnw75 from Great Product Love these dividers. I know they market them towards babies closest but they work for anything. My slight OCD tendancies loves them for organizing my T-shirts into long sleeve, short sleeve, event T's, etc. Rated 5 out of 5 by Roxnnid from Great buy Works great helps my daughter keep her clothes organized! Rated 5 out of 5 by KiKiinLA from Excellent Way to Keep Your Clothes Organized! I was so excited when my dividers arrived! LOL! I used a label maker to create labels: Short Sleeve, Long Sleeve, Sweaters, etc. Now my walk-in closet looks perfect! Rated 5 out of 5 by njmomoflittleones from Perfect for organizing closets! I didn't want to spend a ton on "boutique style" closet rod organizers but needed something to divide up my new baby's clothes so I knew what sizes I had. Decided on these and by gluing a little scrapbooking paper, I now have closet dividers that look like I spent a lot more money on. Plastic is strong so I expect these to last a long time! Rated 5 out of 5 by mrsmom from love these! I order these all the time to make personalized closet dividers as they are always wanted as baby shower gifts! perfect to separate all those new baby clothes into each size grouping. Rated 5 out of 5 by pshabo from Sturdy! These organizers are just what we were looking for to seperate our new born's clothes! They are of sturdy plastic material and do not feel flimsy at all. You can make your own labels and glue or tape them on as well! Rated 5 out of 5 by Kimbojinks from Most Helpful in the Closet This is the best product I've found to use in our closet. We live in an apartment so we can redo the shelving and it was a struggle to find labels that fit on whose white wire shelves. These fit perfectly and look great. Such a simple fix for the organization I needed. A perfect product! Rated 5 out of 5 by DesignDamsel from Little product but Big impact This is such a convient little product. I consider my closet very organized but these take it to another level. I love that they seperate everything into whatever category I want. I do think they are a little plain though so I decorated them but either way I think they are a great addition to any closet. Rated 4 out of 5 by CraftyMom2010 from Nice I purchased these to decorate them and give them as a gift for a baby shower. They get the job done and are very sturdy. I just wish they were a little larger around so that you can easily see the design on the paper and the sizes. I would recommend them to a friend that. Rated 5 out of 5 by hopet from great organizing product I love this invention. These dividers allow me to organize my hanging closet items per whatever 'type' I designate. They look tidy and are brainless to use. How many Blank Closet Rod Dividers come per pack? They are sold individually, so $0.99 each. Are the closet rod dividers flexible enough to put on the rod from the middle? I don't want to have to remove the rod. Just add the dividers. Thanks. They were flexible enough for me! I didn't have to remove the rod, but I suppose it would depend on how thick your rods are. Will a printable CD label fit on this divider? The diameter of the divider is 3.5&quot;, with a center opening of 1 3/4&quot;. Most CD labels are 4.5&quot; in diameter, so would not work. However, if you are able to find a label that fits between 1 3/4&quot; and 3.5&quot;, that will work, provided you cut a slit in it for the clothing bar to pass through. Has anyone tried these inside a wire shelving closet? Or, can someone measure from the inside to the outer edge and tell me if this is more than an inch? I just want to make sure they clear the top easily. Thanks so much! The Blank Closet Rod Divider has a 3-1/2&quot; diameter. The interior has a 1-1/4&quot; diameter. The outer edge is 1-1/8&quot; wide. School bells are beginning to ring all around the country and moms everywhere are getting everything together to ensure that their families have a smooth transition from summertime to school time. 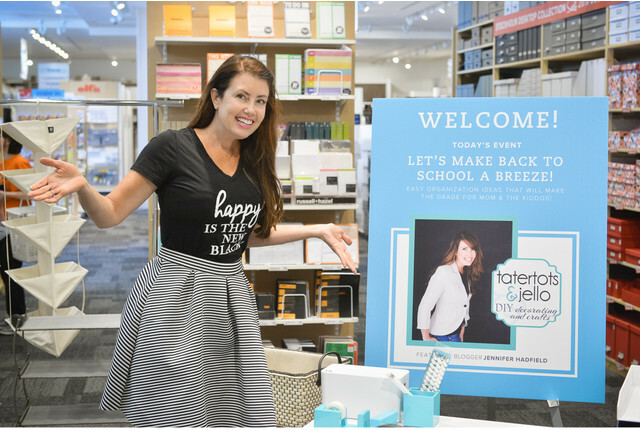 We recently had a ton of fun with some of our favorite bloggers who paired their personal tips and systems with our product solutions to share some fabulous ideas for heading back to school.